Q1. Which of the following answers is the least likely reason for an engineer to choose to use route redistribution? Answer: D. The three incorrect answers list typical reasons for using route redistribution. The correct answer—the least likely reason among the answers for using route redistribution—lists a problem for which an OSPF virtual link is often used. Route redistribution could be attempted to solve a problem with a discontiguous OSPF area, but the redistribution completely changes the LSAs that would have otherwise been known and could have negative impacts on route summaries and cause routing loops, and have other problems as well. a. The router must have one routing protocol configured, but configuration for both routing protocols is not necessary. b. The router must have at least one working link connected to each routing domain. c. The redistribute command must be configured under EIGRP to send the routes to OSPF. d. The redistribute command should be configured under OSPF to take routes from EIGRP into OSPF. Answer: B and D. For a router to redistribute routes between two routing protocols, the router must have both routing protocols configured, have a working link into each routing domain, and configure redistribute commands under each routing process. The redistribute command, issued in routing protocol configuration mode, pulls routes into that routing process, from another routing process as referenced on the redistribute command. a. Let the metrics default. b. Set the metric components using the redistribute command’s metric keyword. c. Set the metric components using the default-metric router subcommand. d. Set the integer (composite) metric using the redistribute command’s metric keyword. Answer: B and C. Because the metrics come from a different routing protocol than EIGRP, the metric must be set. The metric must be set with five components; EIGRP will then use those components as it would for an internal route. The metric components may be set as listed in the two correct answers, plus using a route-map as referenced by the redistribute command. Q4. Examine the following excerpt from the show ip eigrp topology 10.2.2.0/24 command on router R1. Which answer can be verified as definitely true based on this output? a. R1 is the router that redistributed the route. b. R1’s metric to reach subnet 10.2.2.0/24 is 64.
c. The route was redistributed on a router that has a router ospf 1 command configured. d. R1 is redistributing a route to prefix 10.2.2.0/24 into OSPF. Answer: C. This output is the external data section of a detailed view of an EIGRP topology table entry for an external route. This output confirms that this route was redistributed into EIGRP. If R1 were the redistributing router, the output would include the phrase “(this system)”; this example does not include that notation. The output means that on the router that did the redistribution, the route was redistributed from OSPF process 1, and the OSPF metric was 64. R1’s metric is not based on the OSPF metric of the route. Q5. Router R1 has a connected route for 10.1.1.0/24 off interface Fa0/0. Interface Fa0/0 has been enabled for OSPF due to a router ospf 1 and network 10.0.0.0 0.0.0.255 area 0 command. R1 also has EIGRP configured, with the redistribute ospf 1 metric 1000 100 10 1 1500 command configured under EIGRP. Which one of the following is true? a. R1 will not redistribute 10.1.1.0/24 into EIGRP, because R1 knows it as a connected route and not as an OSPF route. b. For any OSPF routes redistributed into EIGRP, the metric components include a value equivalent to 1 Mbps of bandwidth. c. For any OSPF routes redistributed into EIGRP, the metric components include a value equivalent to 100 microseconds of delay. d. No subnets of network 10.0.0.0 will be redistributed due to the omission of the subnets parameter. Answer: B. The redistribute ospf command will attempt to redistribute OSPF routes and connected routes from interfaces on which OSPF is enabled. The metric components include 1000 Kbps (or 1 Mbps), 100 tens-of-microseconds (or 1000 microseconds), 10 for the loading, 1 for the reliability, and 1500 for MTU. The EIGRP version of the redistribute command does not include a subnets option. b. Use each redistributed route’s OSPF metric using the redistribute command’s metric transparent keywords. c. Set the metric using the default-metric router subcommand. 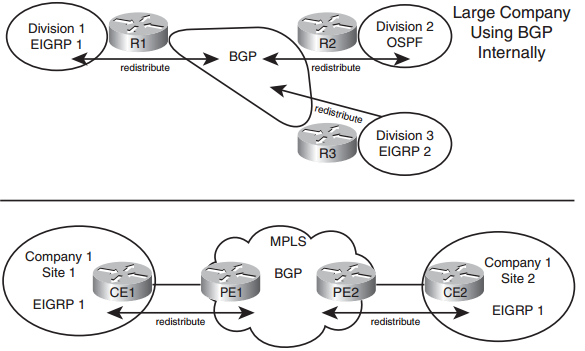 d. Redistribution is not allowed between two OSPF processes. Answer: A and C. Because the routes come from OSPF and feed into OSPF, the metrics can be set with the usual tools, or the metric can default. When taking routes from OSPF into another OSPF process, the default metric is taken from the source route’s OSPF cost. Alternatively, the metric can be set for all routes, regardless of the route source, using the default-metric OSPF subcommand. The metric transparent keywords cannot be used for an OSPF redistribute command. Q7. Examine the following excerpt from the show ip ospf database asbr-summary command on router R1 (RID 1.1.1.1). Which answer can be verified as definitely true based on this output? a. The output describes the contents of a Type 5 LSA. b. 3.3.3.3 identifies a router as being the router performing redistribution. c. R1’s metric for its best route to reach the router with RID 9.9.9.9 is 100.
d. The router with RID 3.3.3.3’s metric for its best route to reach the router with RID 9.9.9.9 is 100. Answer: D. This command lists the output of Type 4 Summary ASBR LSAs. The LSID identifies the redistributing ASBR (9.9.9.9). The advertising router is the ABR that created and flooded the LSA (3.3.3.3), and the metric is the ABR’s best metric route to reach the ASBR. Q8. Router R1 sits inside OSPF area 1. Router R2 redistributes an E1 route into OSPF for prefix 2.2.2.0/24, with external metric 20. Router R22 redistributes an E2 route for the same prefix/length, external metric 10. Under what conditions will R1 choose as its best route the route through R22? a. R1 will always choose the route through R22. b. As long as R1’s best internal OSPF cost to reach R22 is less than 10.
c. As long as R1’s best internal OSPF cost to reach R22 is less than 20.
d. R1 will never choose the route through R22 if the E1 route through R2 is available. Answer: D. Routers add internal and external costs for E1 routes and use only external costs for E2 routes, so the cost for the route through R22 will always be lower. However, for a given prefix/length, OSPF always prefers intra-area routes first, then interarea, then E1, and finally, E2, all regardless of metric.